There is value in our social networks beyond that which serves our immediate needs. Social capital is the ability to use social networks to accomplish something that cannot be done alone. Business social networks are commonly used in areas ranging from product development to supply-chain management. On a wider scale, social capital can be matched with open innovation through appropriate Internet and physical channel expansions to develop something new for economic development. We must only think of how each person enters an economic system through their own particular way of viewing the world. They are defined by their background, education, skill set, cultures, experiences and social networks to view topics from a particular vantage point. Problems are defined based upon how they understand them through historically perceived practical solutions. As these elements begin to act and interact with each other they create new definitions on how to see problems and potential solutions. The longer they interact solving a significant problem the more likely they will share mutual definitions and perspectives. It is a process of social learning and thought construction based in social construction mechanisms of elemental interaction. Few relevant solutions come from a single vantage point. All sustainable solutions are socially negotiated to develop new premises and conclusions. It is the changing of perspective, a focus on the solution, and the enactment of a plan that changes the reality of network members. Philosophical reality can be defined as a perspective of communicated why and why nots that enhance shared explanations. With open-mindedness and active listening people begin to adjust their perspective and understand the factors in new and unique ways. This adjustment often leads to new solutions for complex problems and greater heights of awareness for involved members. It becomes something bigger than themselves that leads to enlightenment about the nature of life and best paths forward for a people, organization, city or nation. Mathews and Marzec (2012) studied social capital from varying industry perspectives and developed a model that fits well with operational management. One can see the similarities on how it applies to wider platforms and networks that improve upon social innovation and economic development. Using relational, cognitive, and structural capital it is possible to enhance HR practices to turn initial social capital into resulting social capital that produces meaningful solutions for a wide group of stakeholders. Brookes, N. et al., (2007) Analyzing social capital to improve product development team performance: action-research investigations in the aerospace industry with TRW and GKN. IEEE Transactions on Engineering Management, 54 (4), 814–830. in quality management. Journal of Operations Management, 25 (4), 918–931. Cousins, P.D., et al., (2006). Creating supply chain relational capital: the impact of formal and informal socialization processes. Journal of Operations Management, 24 (6), 851–863. Granovetter, M. (1973). The strength of weak ties. American Journal of Sociology, 78 (6), 1360–1380. Mathews, R. & Marzec, P. (2012). 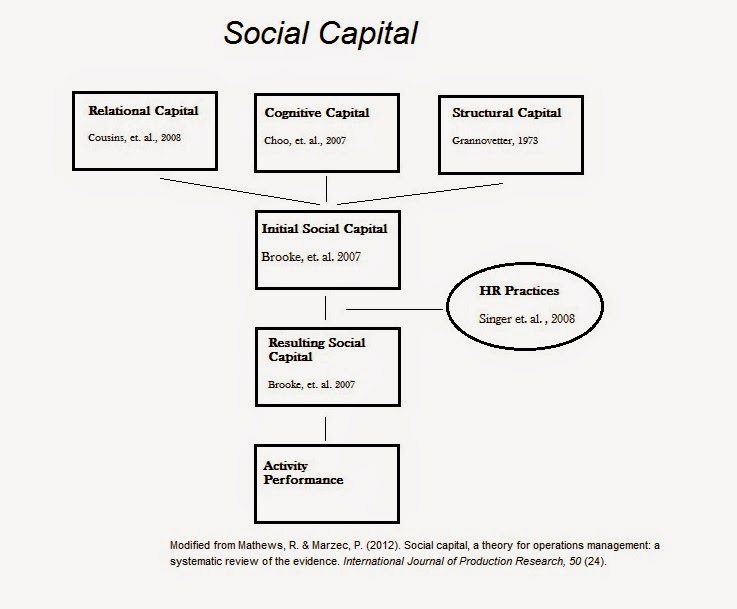 Social capital, a theory for operations management: a systematic review of the evidence. International Journal of Production Research, 50 (24). Singer, M. et. al. (2008). A static model of cooperation for group-based incentive plans. International Journal of Production Economics, 115 (2), 492–501.